If Pinterest is for Women, What is the Social Network for Men? By now you’ve probably heard of Pinterest, the social network that allows users to build virtual bulletin boards of anything they like on the internet. The popular site also happens to be the fastest website ever to reach 10 million users. Today, Pinterest has grown to over 13 million users, many of which happen to be women. Some reports claim that up to 80% of active Pinterest users are women. Clearly, with this large percentage of female users, Pinterest’s content ends up being very skewed. While some of the content can appeal to men, as it stands right now, Pinterest has become a social network for women. But, what about men? What about the guys who want a fun, image-based way to bookmark and discover interesting things from around the internet? Surely, there has to be some social media platform for them. Luckily, there is. It’s called Gentlemint. 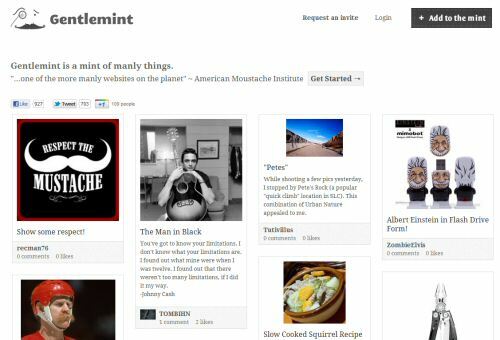 Gentlemint is a new social network that is almost identical to Pinterest. However, whereas Pinterest’s content is heavily slanted toward women, Gentlemint is purely a collection of manly things. The two creators behind Gentlemint were slowly developing the project over two years, but decided to kick their development into full gear and built the site in 12 short hours. After testing the site themselves, tacking humorous things to try to make the other laugh, they sent the link over Twitter and with their friends. A few days later, Mashable featured Gentlemint on their blog. Now, thousands of people are requesting invites for the site and the two creators are working tirelessly to keep the site up and running, monitoring feedback, and doing interviews. Because the site is growing so fast, the creators have had to put the release of some new features on hold as they improve the site stability. Currently, Gentlemint lets you follow other users and “tack” (like Pinterest’s “pinning”), comment, and like photos. However, the functionality of the site is fairly limited, and the creators know this. They say that in the near future they will be releasing new features, like the categorization of tacks (like Pinterest’s boards), search, a better method of saving tacks, and new way for finding interesting tacks. In my opinion, Gentlemint has tons of potential. However, the site really needs the updated features. Once they are added, the site will be greatly improved. For men wanting a Pinterest-like experience, minus the pins about clothing, interior design, and recipes, Gentlemint is the perfect alternative. About the author: August Drilling works on behalf of FortePromo, which sells promotional items, and loves blogging, design, and Apple. First time to hear Gentlemint..it seem very interesting site. recommend for sure.